Today, in a prelude to the Venus Transit just 18 days from now, the 2-day old Moon covered Venus' very slim crescent and hid the planet from view for observers from Europe to central Asia. Many in central Europe, e.g. those near the ESO Headquarters in Garching near Munich (Germany), were frustrated to see clouds moving in during the hours before. 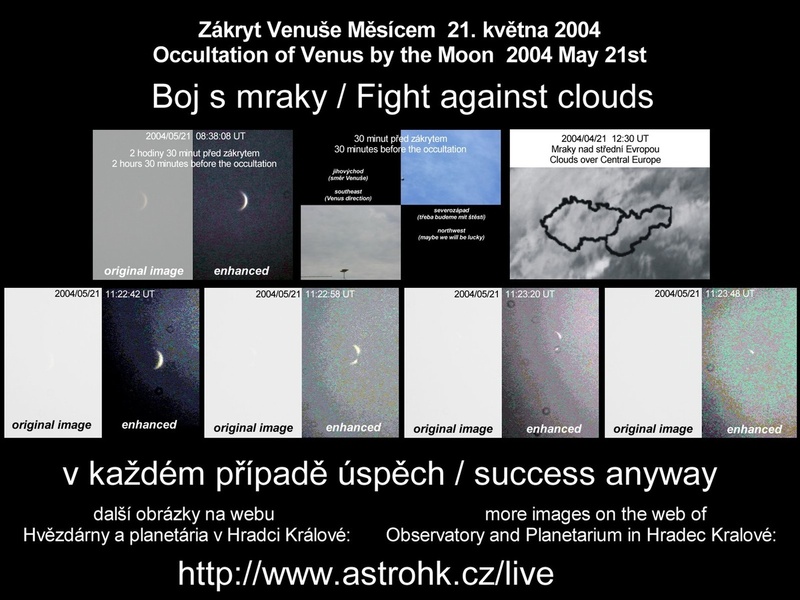 However, others were able to make fine observations of this event, see the photo-montage by Jan Vesely and collaborators of the Public Observatory in Hradec Kralové (Czech Republic). A short video [ Animated GIF - 688k] was prepared by Herbert Raab of the Linzer Astronomische Gemeinschaft (Austria). More photos will be added to the VT-2004 Photo Archive as they become available. At the time of this "Venus Occultation", Venus was at a distance of approx. 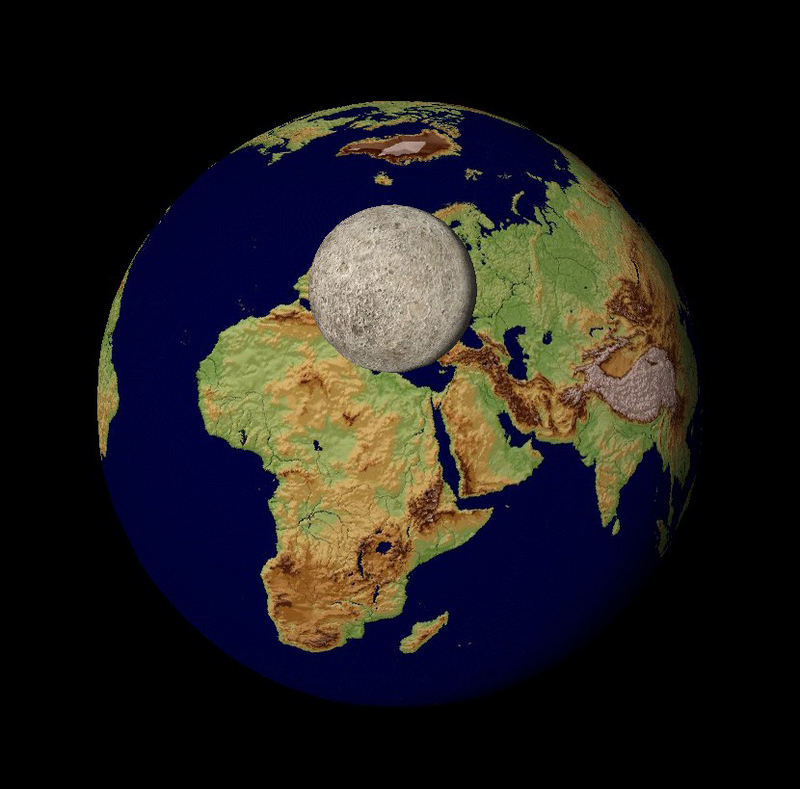 50 million km from the Earth. A fictitious observer, located just outside the dense atmosphere above Venus' southern pole would have seen the Earth partly covered by the Moon [ Computer drawing - 304k]. This drawing also illustrates the relative sizes of our planet and its companion. The next Venus occultation will take place on November 10, 2004, and be visible from Australia. On that date, Venus will be about 194 million km from the Earth and will therefore appear nearly four times smaller than this time. Useful advice is now available at the "Day of the Transit" area for all who want to partake in this unique celestial event on June 8, 2004, and who are not professional or amateur astronomers. The step-by-step join-the-transit explanations contain plenty of ideas and suggestions for how to get the most of this occasion! The pages, chronologically arranged, carry the titles "Beginning now", "Ten days before", "A few days before" and "THE DAY!" and provide guidance on how to be well prepared for the event. A preview is now available of the first part (about 1/3) of the 28-min TV-film about the Venus Transit and the VT-2004 programme, currently in the final production stage in the Czech Republic. It concerns observations of the transit and the involvement of school students and their teachers. The preview may be downloaded from the VT-2004 website [MPG - 83.4 Mb; 11 min; English version], together with an English transcript [Word - 40k and [PDF - 80k]; and also from the special page at the website of the VT-2004 Czech Node. The producers will be glad to discuss the possible use of this material by other broadcasters. Interested parties may contact Ms. Sarka Spevakova, Herafilm (Prague), by Email: sarka.spevakova@popularis.cz or mobile phone: +420 724 348 388. Many VT-2004 National Nodes have been extremely active during the past weeks, preparing for the Venus Transit in their respective areas in different ways. On most of the corresponding websites, detailed information is now available in the local languages, reflecting the broad international scope of this public programme. A look at these websites will reveal the enormous width of the activities and numerous links across the borders. In many places, there will be references to historical expeditions to the corresponding sites, e.g. in northern Norway, Siberia and Tasmania; in at least one place, a telescope, used during observations of the two Venus transits in the 19th century, will again be on display. Special efforts have been directed towards the schools and it is gratifying to note that they have clearly been successful - a very large number of classes all over the continent are now preparing to witness the transit, most also doing their proper observations. For this, the VT-2004 educational materials have obviously been of use, especially since translations into a large number of languages are now available via the National Nodes. More groups and individual observers have registered with the VT-2004 Observing Campaign; the count by May 21 was 623 and rising rapidly. Of these, 203 were school classes, 226 were individuals, 125 were astronomy clubs and 69 were others. 89 countries are now represented, from Afganistan to Vietnam (alphabetically), Norway to South Africa (North-South) and Mexico to Australia (West-East). The introductory page for amateur astronomers has been updated with more useful links towards the many pages at the VT-2004 website that describe fine opportunities for observations of the Venus transit, as well as interaction with the general public. As members of the local communities and present in virtually every city on all continents, amateurs will have great opportunities to interact with their fellow citizens on this widely publicized occasion. Among the new and very useful features is the "STOPER" software [ ZIP-file(704k)], developed by Arkadiusz Dudka , active member of the VT-2004 programme in Poland. This programme mimics a traditional stopwatch and allows precise time measurements to be made with a PC. It greatly facilitates the timing observations during the transit by means of which the distance from the Earth to the Sun will be determined. This software may be distributed as FREEWARE, provided the author and VT-2004 are credited. A unique CD-ROM has been produced by the Paris Observatory with more than 10,000 fascimile pages of historical documents related to transit expeditions and observations, cf. the description (Word) with some examples of the pages. It includes early texts from the 17th century, as well as the reports of many expeditions in the 18th and 19th centuries, together with numerous, fascinating illustrations. The major part of these documents comes from the extensive library of the Paris Observatory. Access to the facsimiles is either by starting from a chronological list, from the titles of the books and periodicals concerned, or from a text of comments that guides the reader towards the most interesting pages. The comments and the presentation are provided in French and in English. The production of this CD-ROM was supported by Observatoire de Paris, by CNRS and by the European Commission via the VT-2004 program. More information, also about how to order it, is available here. 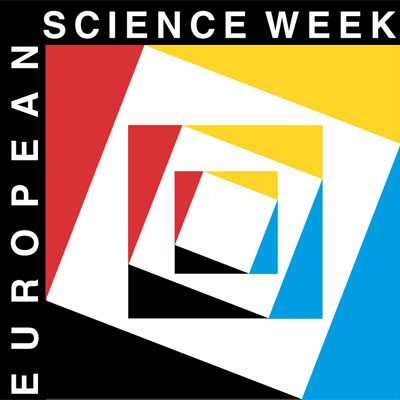 It is also on sale at EDP Sciences at a price of 25 Euros.